I really thought that using whitening soap that makes my skin feels taunt and tight are what's best for my skin. After all, I was seeing the results instantly and that my acne scars did lighten in just two weeks. What I didn't realize was that I was damaging my skin, making it look more tired, dry and rough. Pond's has always taken the lead when it comes to skin care. They are on a mission in providing fairer, whiter skin without sacrificing the integrity of it. Their newest innovation is Pond's White Beauty Pearl Cleansing Gel. It's an Oxygenated Gel with Pearl Essence that aims to whiten the skin while maintaining skin's softness and suppleness. It's the first time I've come across a gel cleanser and oxygenated at that. What I think is its highlight is that Pond's White Beauty Pearl Cleansing Gel is suitable for sensitive skin. Pond's managed to fill the void in the market and provided those with sensitive skin a lightening product suitable for them. To futher prove that Pond's White Beauty Pearl Cleansing Gel is safer and milder to the skin, a demo was made using zein films that mimics skin's natural protein structure. The photo above will show that using thoe harsh whitening soap breaks down our skin's natural protein. This leads to dryness, roughness and uneven whitening. While the other film dipped in Pond's White Beauty Pearl Cleansing Gel showed that the protein's integrity didn't deteriorate as harshly. Showing that lightening is possible with milder and safer ingredients and form. Highlight of Pond's White Beauty Pearl Cleansing Gel is definitely its innovative gel form that cleanses face safer and much better. The other is White Beauty's staple effective whitening ingredients which is Niacinamide and Vitamin B3, some of the safest and most effective whitening ingredients. Lastly, the Pond's added Pearl Essence, an ingredient used for centuries to whiten skin. I gotta admit though that the experience using this is totally different from regular soaps or cleanser. I've tried gel cleansers before but nothing quite like Pond's White Beauty Pearl Cleansing Gel. Compared to the very few gel cleansers I've tried, Pond's White Beauty Pearl Cleansing Gel maintained it's gel form even with water contact. It only formed to a foamy texture when I started to rinse it out. The texture is also quite slimy (for the lack of better term) that I initially thought that I was just moving the product around my face. Quite unusual and sort of perplexing, too. I wasn't quite sure if I was going to use it again. But as I rinse it out and continued to wash my face, there I noticed that it's working onto my skin and I could feel my skin turning soft. Was it refreshing? Most definitely! I thought that it would feel too moisturizing that I wouldn't get that "freshly washed face"feel but I did feel that cooling sensation after. I have to admit that it takes getting used to considering Pond's White Beauty Pearl Cleansing Gel is a new format. But I have to give points on it being more gentle to my skin compared to the orange soaps I've tried in the past. And the light rose scent is nice. So would I continue using Pond's White Beauty Pearl Cleansing Gel? Definitely. I'm loving the mild cleansing feel that I thought I would never get from a whitening product. But as to its effect, I have to get back to you on that since I've only been using this for four days. 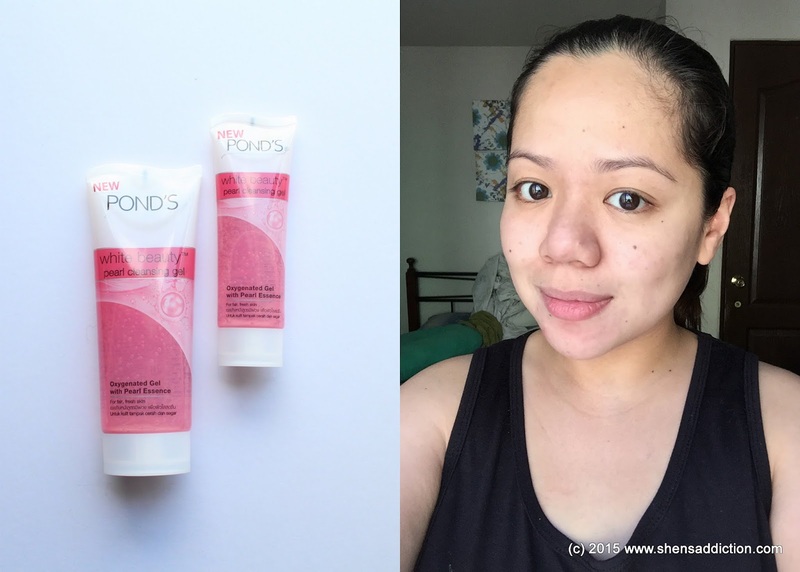 My skin before trying out Pond's White Beauty Pearl Cleansing Gel was experiencing dryness in some areas which was unusual since I've always been oily. This new cleanser addressed that concern immediately, giving it the moisture it needs. What you'll love about Pond's White Beauty Pearl Cleansing Gel? 1. It's affordable! - Pond’s Pearl Cleansing Gel is available 50g (Php85) and 100g (P155). 6. No more dryness or roughness - Pond's White Beauty Pearl Cleansing Gel format is absorbed to the skin and has a new sensory feel that makes skin feel smooth and soft after wash.
7. A pea-size is enough to cver the whole face and get that well-cleansed feel.